Cannon County’s mascot is one of the best in the country. Sports enthusiasts in Cannon County already realize the impact “Leo the Lion” brings to CCHS athletic events. The rest of the country will have an opportunity to see it first hand when Leo travels to Orlando, Fla., to participate at the Capitol One Bowl in December. Leo was named one of three All-American mascots at the University of Tennessee cheer-leading and mascot camp in July. The three All-Americans earned the right to participate in the Capitol One Bowl. Cannon County’s mascot will be featured along with some of the nation’s top high school and college mascots as part of the pregame show. Jeffrey Northcutt is the person who brings life to the Lion costume and in three short years he has helped make Leo a fan favorite. Northcutt is in his third – and final – year working as the Lion. A senior at CCHS, Northcutt downplays his impact on the sports scene but his performance at the University of Tennessee can’t be softened. 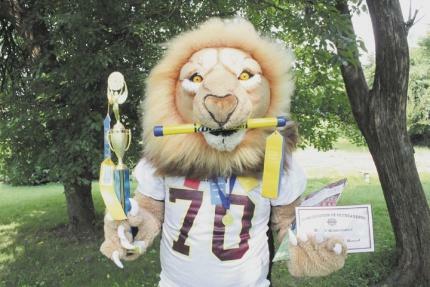 Leo the Lion, who was attending its first such camp, was one of the most successful performers of the week. Cannon County’s Lion won the Spirit Stick – which is regarded as one of the top honors given in the cheer world. It also won a ribbon for best dancer, third best mascot of the week, as well as the Superior Mascot Award and the Leadership Award. It was by chance Northcutt became a mascot. Doors that may lead to a college gig. Doors that may assist in paying for Northcutt’s college education. He will tryout for the role of “Smokey” – the University of Tennessee mascot – in April. He also intends to tryout for “Lightning” – MTSU’s mascot. Northcutt has taken Lions fans on a wild ride the past two years. One can only anticipate what the fun-loving Lion has in store for fans in 2013-14. He is active, crowd friendly and works hard to entertain the faithful Lions fans. Northcutt’s job isn’t all fun and games. The suit is generally 40-to-50 degrees hotter than the actual temperature. Northcutt is supposed to be getting a new costume this year but the heat won’t diminish, nor will his desire to help make Leo the best. Most fans never see the man behind the mask or know much about him and Northcutt says that is the way he prefers it. Leo the Lion has burst onto the scene during the last two-plus seasons. He will be featured amongst the best of the best when he attends the Capitol One Bowl in Orlando.